Natural scenes contain complex patterns formed by interaction of a large number of forces acting over time and upon a great canvas. These forces can have an important and direct influence on the scene (for example, sunlight, tree branching, or waves on a lake), or they can have a subtle or indirect influence, much like atmospheric turbulence, nutrient diffusion in the soil, or the combined actions of insects and small animals. When these varied forces interact, they create structures and patterns in sight and sound that are more complicated than any single force could itself create. From this interplay of great numbers of forces come the sensations that are the cornerstone of humans’ perception of beauty. The aim of my work is to untangle this convolution by separating the underlying forces and processes from their earthly manifestations. Only when studied individually or in small numbers can their own influence on our perceptions be revealed. Landscape photographers attempt this when they isolate features such as sand dunes, slot canyons, or leaf piles in their images. Computers have opened the door to even deeper exploration, allowing us to separate and recombine the multiple forces involved in those, and other, scenes. Exploration of these minimal sets of elementary co-acting forces creates images that resemble no naturally occurring scene, yet still evoke a feeling of familiarity or a perception of beauty. 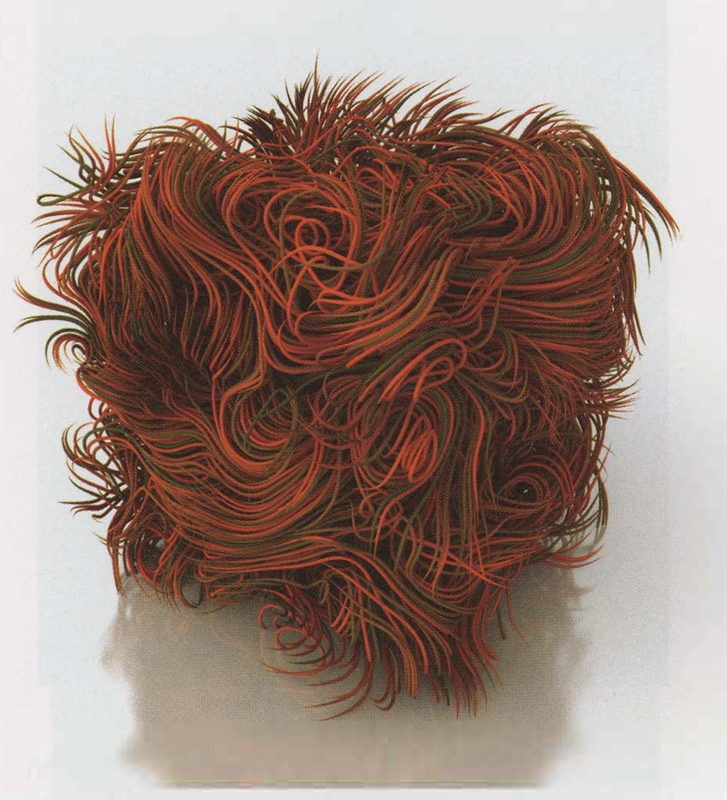 Red streamlines investigates the essential character of wavy, rotation-dominated flow. Low-speed fluid motion (the kind with which we are innately familiar) can be described most compactly by its rotational component. The influence that the rotationality has on the flow drops off in relation to the distance squared, much like many other important processes in nature. Thus , shapes common to wavy flows can be seen not only in air and water, but in landforms as well. A common element in most of my work is the interreflection of light throughout a scene, and this piece is no exception. Including this effect in an image gives virtual objects context and ties different parts of a scene together. Computing this interplay of light and shadow is no small task, but it lends believability to a scene, no matter how unphysical the objects in it may be. If the viewer can focus on the object itself, and not be distracted by its artificiality, communicating its form and shape is most effective. blobs, each imparting a motion to the particles. A fast algorithm was used to sum the individual influences and compute the paths. The Radiance Synthetic Imaging System rendered the final scene at a very high resolution and used an under-sampled global illumination method to calculate the effects of light interreflection.